When photographer Ricci Shryock met up with a group of Eritrean migrants in Milan, she noticed they had one thing in common - most had tattoos. They have asked to remain anonymous because most have fled compulsory military service to go to Italy. Image caption This 24 year old with the tattoos "rule of law" and "everything will pass away" said he left Eritrea because he was forced into military service. Human rights groups say this can last indefinitely. Eritreans are among the largest group of recent migrants to Europe. Image caption This 24-year left Eritrea because, after four years, he had had enough of military service. He left his mother, who the tattoo is about, in the capital, Asmara. The UN says conscripts are subjected to "slavery-like practices", such as hard labour, with poor food and wretched pay. Eritrea says this is not true. Image caption This 22 year old said: "I got the angel Michael to protect me". Like most of these men he travelled overland from Eritrea to Libya, then by boat across the Mediterranean to Italy. Thousands of people have died undertaking this journey - either in the desert, or when their overcrowded boats capsize. Image caption This 20-year-old said he prayed constantly during the dangerous trip from Libya. "On the boat we prayed out loud three times a day, but in my heart, there was no rest." His tattoo says: "Rely on the Cross". Image caption This 25-year-old said he spent five years in the military as part of the country's forced conscription policy. He got this tattoo of Jesus Christ before undertaking the journey. Image caption This man said he chose his tattoo after seeing a film featuring a dragon before he left Eritrea. 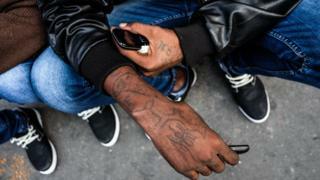 Image caption This 19-year-old with the tattoo "I Love Mum" said he has not been able to speak to her for six months. He said his mother cried and told him not to leave when he told her he was going to Europe. Image caption "My mother is my star," said this 17-year-old, whose tattoo reads "I Love You Mam". He didn't tell her when he left for Italy. "I didn't want her to worry".